UCF Celebrates the Arts, an annual festival showcasing the creativity, innovation and collaboration across the University of Central Florida, returns to Dr. Phillips Center for the Performing Arts for its fifth year April 5-14. 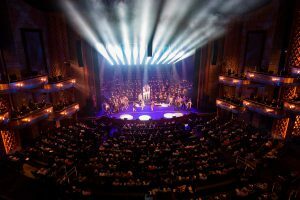 The festival will include more than 30 events and exhibitions spanning 10 days, opening with the Tony Award-winning musical Titanic and closing with the National Young Composers Challenge Composium—a collaboration with the Orlando Philharmonic Orchestra. The festival will include more than 30 events and exhibitions spanning 10 days. The festival consists of presentations by the School of Visual Arts and Design and the School of Performing Arts, with collaborations across the university and community partners, including the Orlando Repertory Theatre, Orlando Shakes, the Creative City Project, the Nicholson School of Communication and Media and more. 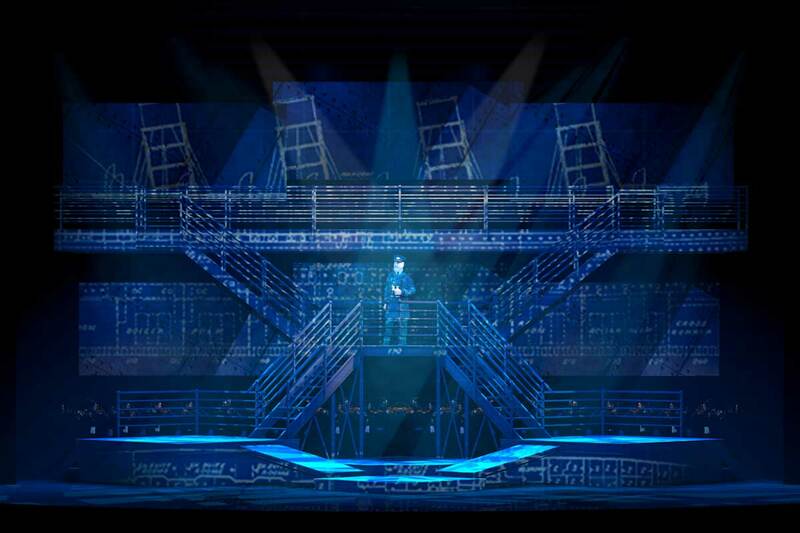 Opening the festival April 5-6 will be Maury Yeston and Peter Stone’s musical, Titanic, which swept the 1997 Tony Awards and won in all five categories it was nominated. The show tells the stories of real passengers aboard the legendary steamer – from the workers in the boiler room, to the first-class attendants, and the poorest passengers who scraped together their life savings to purchase a ticket to America. The musical, which received accolades for its soaring melodies and heartfelt lyrics, will be brought to life by the 80-piece UCF orchestra and a cast of 51 performers. Many of this year’s events and exhibits explore the resilience of the human spirit and the power of art in overcoming adversity. From the historic tragedy of the Titanic to the fictional dystopian future of Emily St. John Mandel’s book Station Eleven, festival participants can explore how art can heal and connect. Some events and exhibits exploring this theme include El Wiz, a musical in response to Hurricane Maria; the Percussion Collective’s performance of Seaborne, which addresses our endangered oceans; and The Middle Passage, a powerful immersion experience where patrons virtually experience life as a captive African on a ship to the Americas. Events connected to the theme of Arts and Resilience are noted below with an asterisk. The NEA Big Read at UCF initiative will coincide with UCF Celebrates the Arts, with many events taking place at the festival. NEA Big Read is a program of the National Endowment for the Arts designed to revitalize the role of literature in American culture and to encourage citizens to read for pleasure and enlightenment. This year, the NEA is supporting 79 communities across the country in this initiative and UCF is one of them. UCF’s 2019 selection is Station Eleven by Emily St. John Mandel. On April 7, students from the School of Performing Arts will present staged readings from works that share similar themes to the novel, followed by an author talk with the award-winning St. John Mandel. Throughout the festival, several events explore the emotional and physical devastation of Hurricane Maria. In collaboration with Orlando Shakes, a workshop reading of the new musical El Wiz puts a twist on The Wizard of Oz when Dorothy is expelled from Puerto Rico by the deadly hurricane. Award-winning performance artist and School of Visual Arts and Design faculty member Wanda Raimundi-Ortiz examines the migration of Puerto Ricans to the continental United States following Hurricane Maria in an interactive traveling performance-art piece titled Exodus|Pilgrimage. As part of UCF Film Night, filmmaker Sonia Fritz’ documentary Después de María, las 2 orillas/After Maria, The 2 Shores examines the reconstruction of Puerto Rico and the migration to Orlando. A continuation from previous years, the 2019 festival highlights the power and impact of music on the world. On April 9, UCF choirs present an eclectic program of music centered on the theme of building bridges. The program concludes with the Florida premiere of American composer Lou Harrison’s “La Koro Sutro,” a vibrant piece written for chorus and gamelan. The UCF Percussion Ensembles concert on April 10 will feature guest artists The Percussion Collective to present the multimedia piece Seaborne, a 30-minute work for six percussionists and video projection creating a percussive art soundscape and visual celebration of our endangered oceans. On April 12, Genius + Soul: The Flying Horse Big Band plays Ray Charles will pay tribute to the most iconic moments of Charles’ career. Special guests include Rob Paparozzi, a vocalist and harmonica player from the Blues Brothers Band; Khristian Dentley, vocalist with Take 6; Vance Villastrigo, pianist and vocalist; DaVonda Simmons, vocalist; and a special surprise guest artist. A new addition to the festival line-up is the National Young Composers ChallengeComposium. The annual event, which formerly took place in October, is the culmination of a year-long competition in which budding composers ages 13 to 18 have their original pieces performed and recorded by the Orlando Philharmonic Orchestra and members of the UCF music faculty, under the direction of maestro Christopher Wilkins. Tickets go on sale at noon Feb. 21 and can be purchased online at arts.ucf.edu or by calling the UCF box office at 407-823-1500. Prices range from free to $50, with admission to most events being $0 or $5. Visit the website for prices. Tickets are required for admission to Dr. Phillips Center for the Performing Arts, including free events. Not all events are listed below. Events are subject to change. Creative work fills the Della Phillips Grand Lobby and Grand Staircase throughout the week. Exhibits include sculptures from the School of Visual Arts and Design on the Grand Staircase, a display created in conjunction with the NEA Big Read at UCF outside of the DeVos Family Room and revolving exhibits from UCF’s humanities departments at tables throughout the center. A fashion display from the late Orlando fashion icon and arts patron Harriett Lake will adorn the front alcove. Yeston and Stone’s Tony Award-winning musical examines the lives of passengers – first class, middle class and steerage – aboard the doomed luxury liner. A festival favorite, Living Art returns to Dr. Phillips Center with 160+ School of Visual Arts and Design students collaborating to recreate famous artworks and model as the subjects in life-size paintings. Enter a world of immersive art through this large-scale projection on the Seneff Plaza in front of Dr. Phillips Center for the Performing Arts and use the motion of your body to transform the projected environment. This 60×25-foot inflatable structure brings the bright, fun and vibrant spirit of the Creative City Project’s annual IMMERSE event to UCF Celebrates the Arts. In this family-friendly performance, everyone is celebrating the placement of the last paving stone covering the only unpaved patch of ground on the planet – everyone except Ito, a girl with ears so big she can hear the ground talking. Threatened with the forever-silenced ground, Ito risks everything to share what only she can hear. Presented by students in the MFA Theatre program studying Theatre for Young Audiences. Project Spotlight showcases plays written, directed and produced by students, for students. In this full-length performance, we follow Michele and Grant from their “emotionally sweaty” prom dance floor to the dumpster-fire days of their early 20s as they try to figure out why rom-coms make first kisses look so deceptively simple. Teams of artists armed with black markers race against the clock to create large-format artwork. The theme will be announced seconds before the start of the event, so come cheer on the artists and help choose a winner at the end of the competition. The finished artworks will be displayed throughout the center for the duration of the festival. In this staged reading, follow along as UCF students read scenes inspired by Emily St. John Mandel’s Station Eleven as part of the NEA Big Read: UCF. Station Eleven author has created an audacious, darkly glittering novel set in the eerie days of civilization’s collapse. Hear the award-winning writer speak about the book. Book signing to follow. Part of the NEA Big Read: UCF. Through drumming, dancing, photography, and other collaborative art-making projects, explore the intersectionality between the arts and wellness in this immersive event for all ages. Thriving represents a partnership between UCF’s Counseling and Psychological Services and Theatre UCF. A powerful program of music that explores feelings of loss, remembrance, and honoring some of the marginalized communities in our society, performed by more than 100 members of the Wind Ensemble and Symphonic Band student groups. A pre-concert talk by internationally-renowned and Florida-born guest composer, Jim Stephenson, will prelude the centerpiece work of the program he composed: Symphony No. 2: Voices. A Puerto Rican homage to the classic story, El Wiz is a heartwarming musical tale of faith and familia. Expelled from Puerto Rico by the wrath of Hurricane Maria, Dorothy is magically transported to the spectacular land of NYOz. On her journey, she encounters familiar faces in Espantapájaros (the Scarecrow), the Hombre de Lata (Tin Man) and León (the Lion). If they can only make it to see El Wiz, maybe they will all find what they are looking for. UCF choirs return with an eclectic program of music centered on the theme of building bridges. The program concludes with the Florida premiere of American composer Lou Harrison’s “La Koro Sutro,” a vibrant piece written for chorus and gamelan. The UCF brass ensembles present a concert celebrating significant musical works for brass. In rotation, a concert featuring performances by the Knight Winds Ensemble, Knights Flute Ensemble, UCF Saxophone Ensemble, Clarinet Choir, Woodwind Quintet and Oboe Trio. With special guests The Percussion Collective, this concert will feature Seaborne, a percussive art soundscape and visual celebration of our endangered oceans. This one-night exhibition showcasing work that weaves together arts and technology, features interactive displays, demonstrations of digital storytelling and tools for video gaming. Witness, understand and empathize life as a captive African transitioning to the Americas through this powerful virtual-reality immersion project. The Flying Horse Big Band takes the stage in a spectacular musical tribute to Ray Charles and the most iconic moments of his career. Special guests include Rob Paparozzi, a vocalist and harmonica player from the Blues Brothers Band; Khristian Dentley, vocalist with Take 6; Vance Villastrigo, pianist and vocalist; DaVonda Simmons, vocalist; and more. In this performance-art procession, award-winning interdisciplinary artist Wanda Raimundi-Ortiz examines the migration of Puerto Ricans to the continental United States due to the ongoing humanitarian crisis in Puerto Rico post-Hurricane Maria. Set in 1930s Kansas, The Tender Land combines the charms of rural Americana with a tale of innocence lost. Award-winning magician and comedian Tony Brent presents Pip Squeak: An Anti-Bullying Magic Show. Because of his small size as a child, Brent was bullied in the cafeteria, in the gymnasium, on the playground and generally anywhere there were no adults present. Now using comedy, amazing magic tricks, juggling and a coat rack loaded with costumes, he gently and humorously teaches children how to cope with being bullied. Float, glide and soar to this multisensory story experience developed specifically for very young audiences (up to 6 years of age) and their grown-ups. Join a pig named Avery and his friends on the farm as they explore what it means to fly through elements of play, discovery, whimsical movement and a few surprises along the way. Meet the next generation of composers. Budding composers ages 13 to 18 are selected from a national competition to have their original pieces performed and recorded by the Orlando Philharmonic Orchestra and members of the UCF faculty. More information can be found online at www.arts.ucf.edu.